An assembly was held last week to give thanks to Mrs Fraher and to present her with two steamer chairs for her garden-many thanks to those who donated towards these. 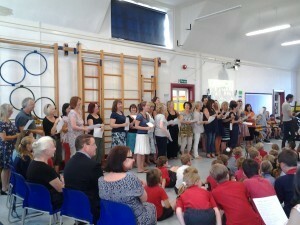 There was music, dancing and even a choir made up of staff members! Well done to our teams who completed at Goodwood motor circuit on Sunday 13 July. 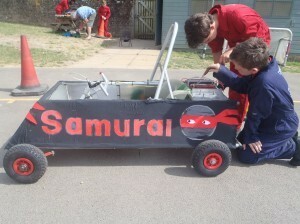 Team Samurai drove fantastically and came first out of 91 teams in the drag race! As always it was a hugely enjoyable day for everyone and all our drivers did well. 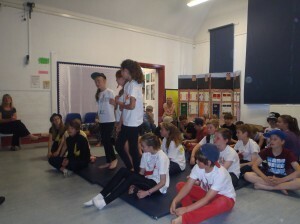 Many thanks to Mr Mustchin, Mr Way and Mrs Tout for all their help on the day. 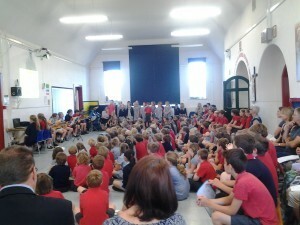 Congratulations to Year 6 who performed their Leavers Presentation to parents on Monday 14th July. We wish them luck as they continue on their journey. 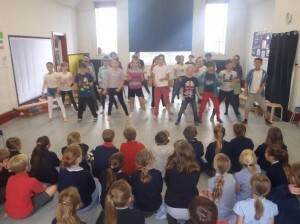 Only flush the three Ps – pee, poo and paper was the message from Southern Water at an annual schools eco-summit. 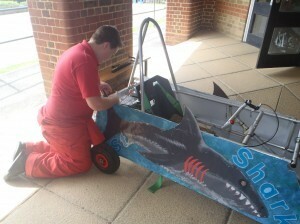 The Worthing-based company was among several organisations which held workshops at the 7th Worthing & Adur EYE (Eco, Young and Engaged) Project Eco-Summit, this year held at the Shoreham Academy. Southern Water’s workshop was about water efficiency and also focussed on the company’s Pain in the Drain message, which encourages people not to pour fat down the drain or flush wet wipes down the toilet. Doing so causes 75 per cent of sewer blockages, which can lead to flooding and pollution. 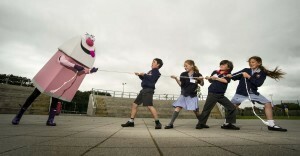 Pupils from St Philip’s Catholic Primary School helped demonstrate the strength of wet wipes – which do not disintegrate in water – by having a tug of war competition with Southern Water’s mascot Mrs Bin-It. The EYE project, founded by Shoreham and East Worthing MP Tim Loughton, encourages young people to make a difference and help the environment. 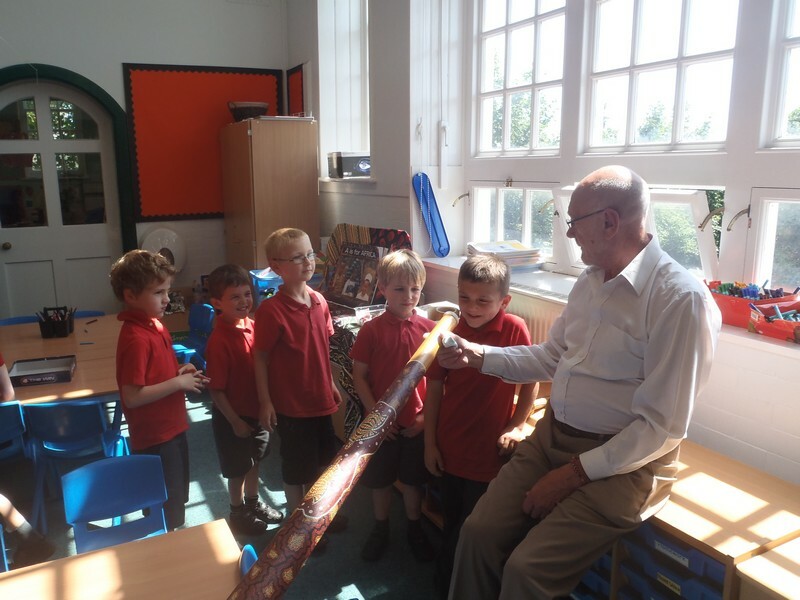 As part of Year 1 and 2’s topic on Globetrotters Years 1 and 2 had a workshop on didgeridoo playing with a professional musician. 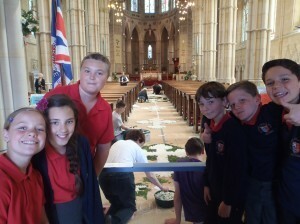 Year 6 were invited by the Cathedral to help lay the Carpet of Flowers this year. 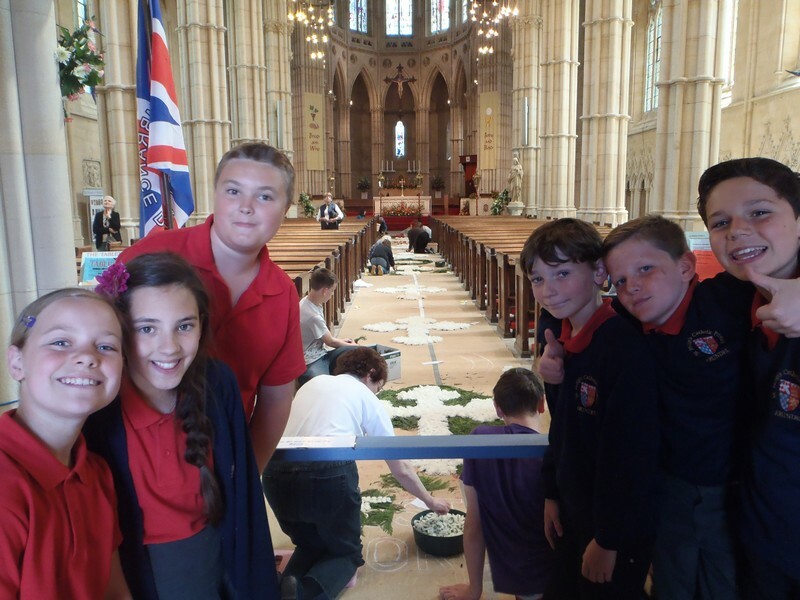 This year’s display was especially poignant as it commemorated the the centenary of the outbreak of the First World War and the men from Arundel who died during the conflict. Year 2 recently visited the allotments at Priory Road. 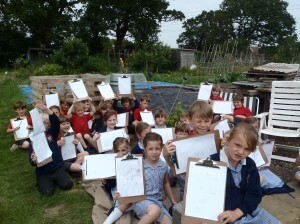 Under the expert guidance of Mr Tanner they sketched the fruit, vegetables and flowers. Once back at school they completed their pictures. A huge thank you to everyone who participated in the walk to Hiorne Tower in memory of Miles, this raised a massive £437.69 for the Snowdrop Trust.